Its Christmas and its crab season here on the West Coast. And that means crab macaroni and cheese. Crazy I know. It is worth the time and effort to make your own bechamel sauce. If you don’t have a Julia Child’s The Art of French Cooking, this will be a good time to pick up your copy. Ideally you want a dutch oven in which you can saute your onions and transfer to the oven for end cooking and to get a nice crust. Boil water for a pound of pasta. Macaroni or a wider noodle that your sauce can stick to. Chop 1 large onion and saute in Tbl of butter in dutch oven. Chop two cloves of garlic and add to saute on medium low heat. Don’t overbrown. Add 3/4 cup of white wine. Turn up the heat and reduce the liquid, again without discoloring the onions. This is kind of like an onion braise. Drain the pasta. The pasta should be al dente; it will be cooked longer in the oven. Bechamel as follows: Make a rouxby combing 2 parts melted butter and 3 parts flour in a saucepan, whisking until lumps are eliminated. Do this on low heat to avoid scorching the butter. The heating is necessary to eliminate the flour taste from the bechamel. This takes approximately 3 minutes. The ratio is the important thing; I used 2 Tbl butter to 3 Tbl flour here. Add 2 cups of whole milk. Julia says to heat the milk, and not to contradict the great lady, but I haven’t found this to make a great deal of difference. The milk is added in small amounts, eyeballing it adding first about 3 Tbl, the next time 6 Tbl, the next double that amount to a total of 2 cups, each time whisking until the mixture is smooth and uniform. The result will look like milk. Now turn up the heat to medium high; as the liquid heats it will thicken. Add salt and white pepper to taste. I prefer the white pepper for color. Add an 1/8 tsp of nutmeg or grate real nutmeg to cover the top of the bechamel before stirring it in. Now add cheese. About 8 ounces of sharp cheddar. Vermont cheddar is superlative. You can grate it or simply cut into small pieces to melt in the bechamel. Vintage Cabot in the purple wax is amazing. Catamount is an excellent cheddar from Cabot, with an interesting taste, slightly sweeter than standard cheddar. Add pasta into the onion/garlic mixture and combine. Add the cheesy bechamel sauce and stir until uniform. Chop sage approximately 2 Tbl and add this as well. Cover and cook in oven at 325 for one hour while you go to couples counseling with your wife. Shelling fresh cooked Dungeness crab is labor intensive but worth it. 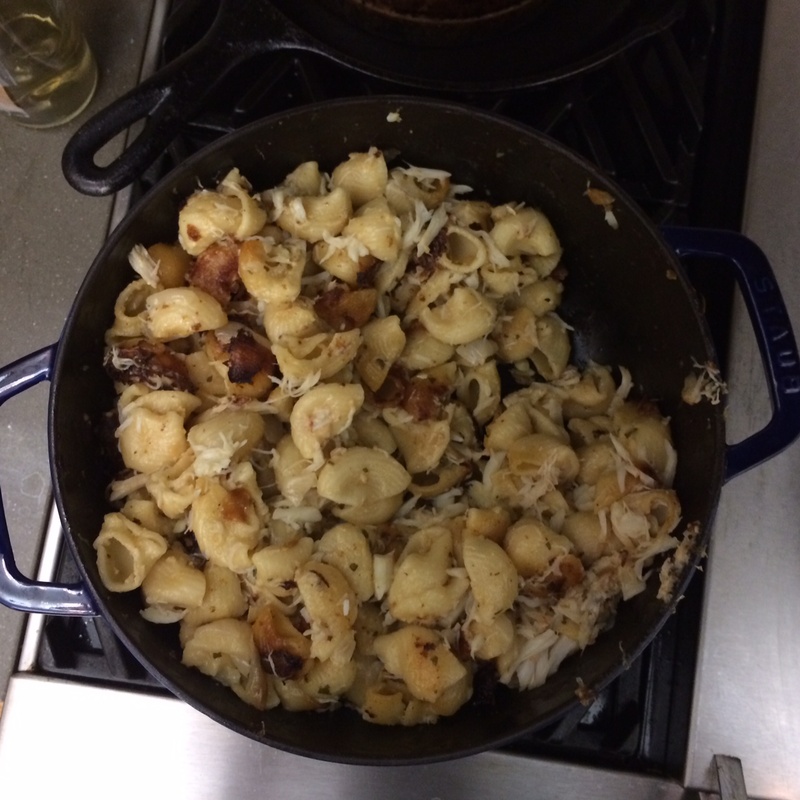 I added the meat I got out of one three pound crab to the mac and cheese, stirring into the mixture and allowing it to equilibrate in temperature. For Dungeness crab about 20% is meat, the rest shell.